When we were planning our activities out for Valentine’s Day I wanted to do something special with the kids, just me and them. Now, we do special things together almost every day but I wanted to find a special time to focus solely on them without thinking about what we needed to do next (or what I needed to work on). And since I’ve been pinning crafts to do with them for a while now I thought it’d be a great time to try out a pin. So after we hosted a super fun Valentine’s Day party with our playgroup I put the kids to bed and got out the ingredients for playdough. I found the “recipe” on one of my favorite blogs, How Does She?, and loved how easy the project sounded so I got to work. It took me all of 5 minutes to take the ingredients out, snap some photos and pre-measure everything. And once the kids woke up we were ready to get our DIY on! 1. Grab a medium pot and pre-measure all of the ingredients except the food coloring (if you’re including a little helper into the mix). 2. Let your little helper dump all of the ingredients into the pot except the food coloring (look at that concentration!). 3. Stir, stir, stir until combined. 4. Now it’s time for the adult to take over (unless your child is old enough to use the stove). Place pot on stove and set heat to medium and add food coloring (as many or as little drops as you’d like to get the color your going for). 5. Stir the mixture until it starts to form a ball. 6. Once the mixture forms into a non-sticky ball, dump it out onto wax paper and let cool. 7. Once the playdough has cooled a bit start kneading the dough a few times until there is a smooth and soft consistency. You can let your helper take over this part for you if the dough has cooled down enough. 8. Re-form into a ball and give it to the kids to enjoy! How easy was that? The playdough lasts quite a while when stored in an air tight container. I love that Missy over at How Does She? repurposed baby food containers to store her playdough so I grabbed some containers I had in the tupperware cupboard that weren’t being used and use them. Little hummus or pizza sauce containers seemed to be the best size and held the full batch of playdough perfectly. Also… if you want your playdough to smell wonderful too I’ve heard that using kool aid as food coloring not only makes pretty colors but leaves great scents too. Cinnamon will do the trick as well but you still have to add the food coloring. And if you’re really wanting to spice things up you can add glitter to the dough to add some sparkle while you’re kneading. What a great afternoon treat! And the perfect way to spend Valentine’s Day with my little valentines. Do you have an awesome DIY project that would work great for kids? I’d love to hear them! We’re always looking for awesome things to do together and to incorporate with our Tot School. This valentine is super easy to make and is the perfect gift for parents, grandparents and special people in your child’s life. I made it two years ago with my son’s feet as a gift for my husband. Then when I was actually making it I figured… his feet are already in the paint, why not make some more?! And I made a few others for his grandma, great aunt and uncle. I personalized them and he presented his gifts on Valentine’s Day. 1. Place a nice amount of paint onto the paper plate, set aside somewhere the kids cant reach it. 2. Tape the paper to the ground to reduce the chance of it slipping around. 3. Take your child’s bare foot and place it in the paint, right foot first. 5. Then dip the other foot, the left, into the paint and do the same to the opposite side of the paper placing the left heel inside the right heel and pointing the toes to the left upper corner of the paper. 6. Let the paper dry completely (you can make multiple at once by lining up the construction paper and stamping feet in a line). 7. 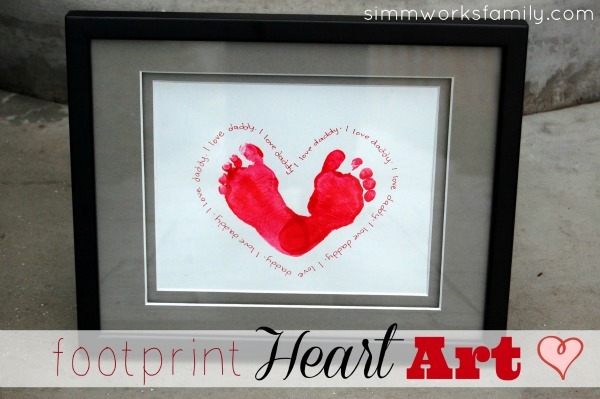 Once the paint is dry start writing your phrase around the feet in a heart shaped pattern. I used, “I Love _____” and filled in the blank with the person we were making the valentine for. You can frame your final product and wrap it to present as a cute keepsake or leave unframed and let your child hand it to their loved one. I’ve also seen this done with hand prints as well which would be equally as cute! 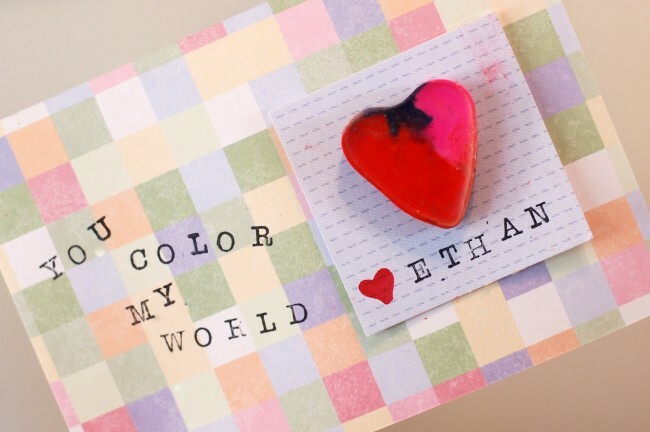 Have you made cute DIY valentine’s with your kids this year? I’d love to see what you have! Feel free to place your link in the comments below. 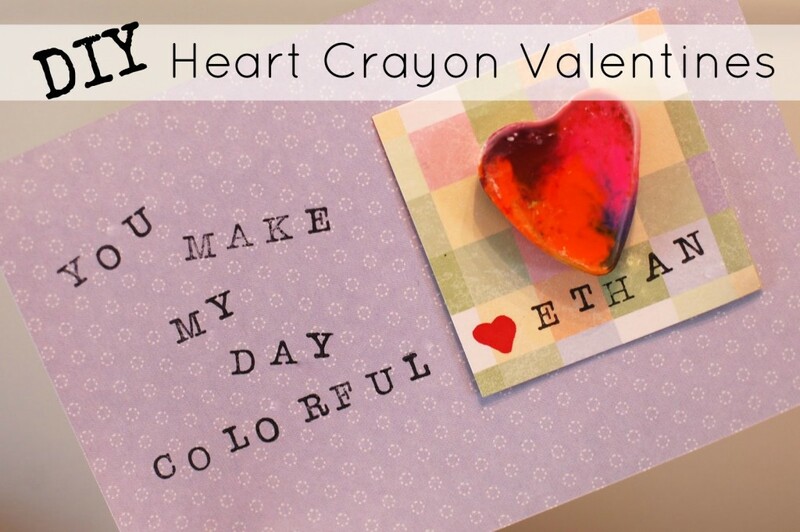 I first saw the crayon heart valentines on the Family Fun website. I thought they looked adorable but didn’t have a heart mold so I figured I’d just send the regular store-bought valentines instead since I had a few I purchased on clearance a few years back. Then we went to Target and I saw the heart molds in the dollar section of the store and I couldn’t pass up the opportunity. Plus they were all over Pinterest! 1. Place your crayons in a heat proof dish & preheat oven to 250 degrees. 2. 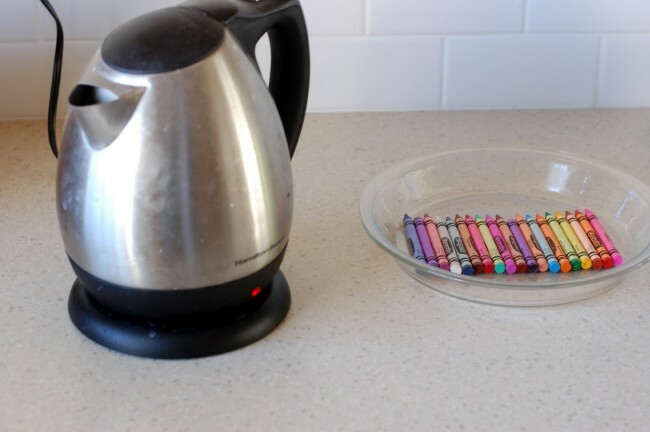 Heat up some water and pour warm water on crayons (note: do not use boiling water… crayons might melt). 3. 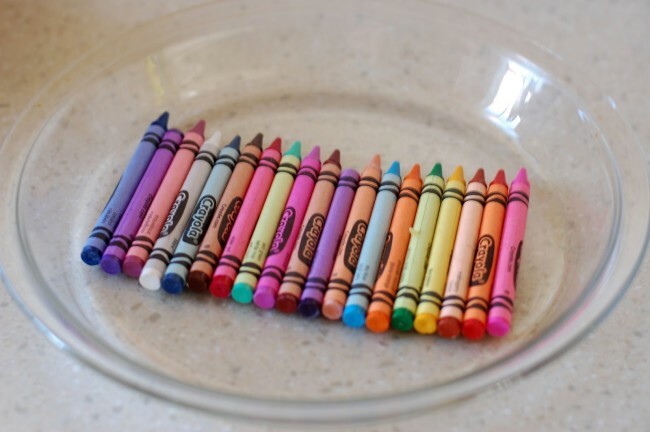 Let crayons soak for 30 seconds (see what happens when your water’s too hot?). 4. Unwrap crayons (any that didn’t unwrap easily after soaking are set aside and not used). 5. 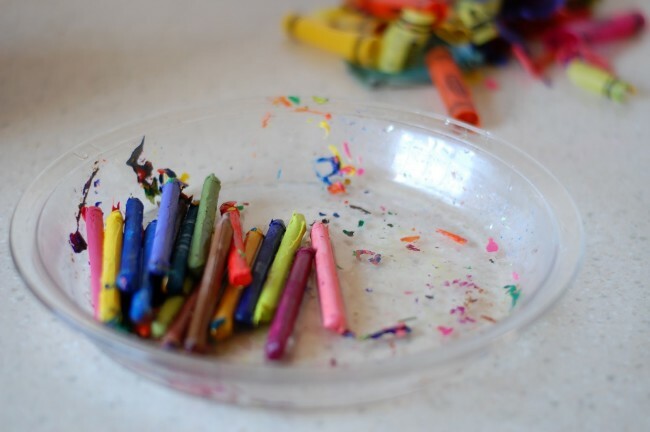 Put crayons in a dish and let kids break them up into small, tiny pieces (or put them in a bag and hammer with a kitchen mallet or meat tenderizer until broken up). 6. 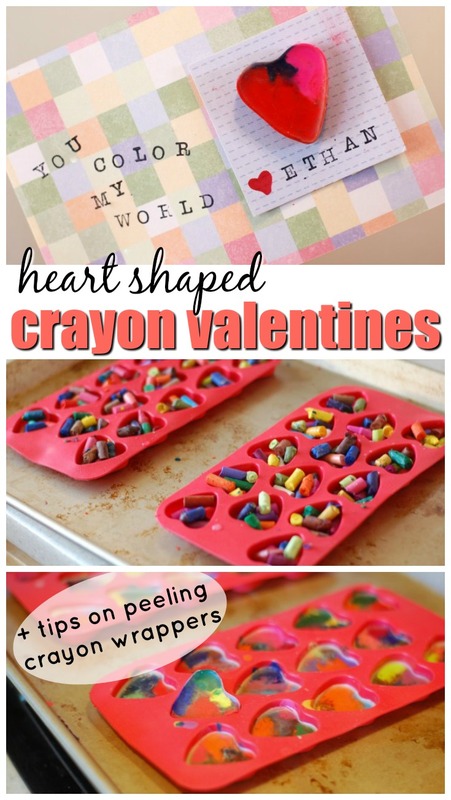 Place heart molds on a rimmed baking sheet and fill with broken crayon pieces. 7. 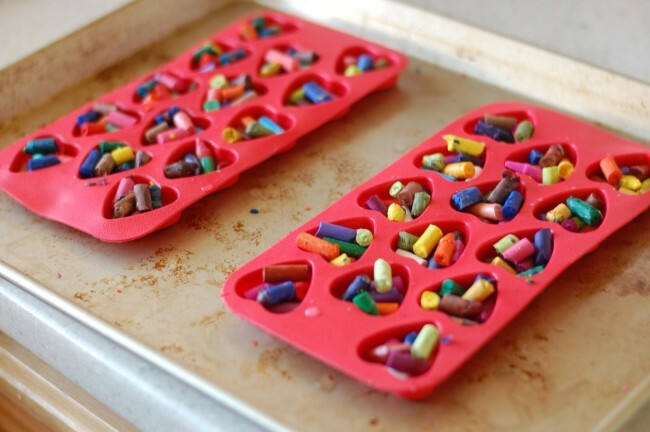 Place tray in oven and bake for 15-18 minutes or until crayons are fully melted. Then carefully take out of oven and set aside to harden. 8. 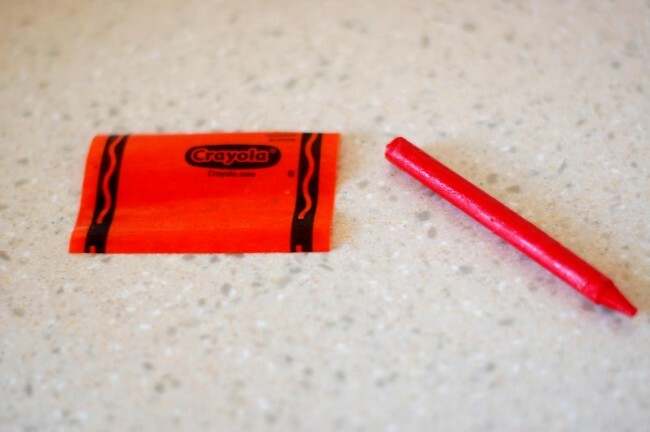 Once cooled completely pop crayons out of molds and smooth edges by rubbing against a piece of paper. 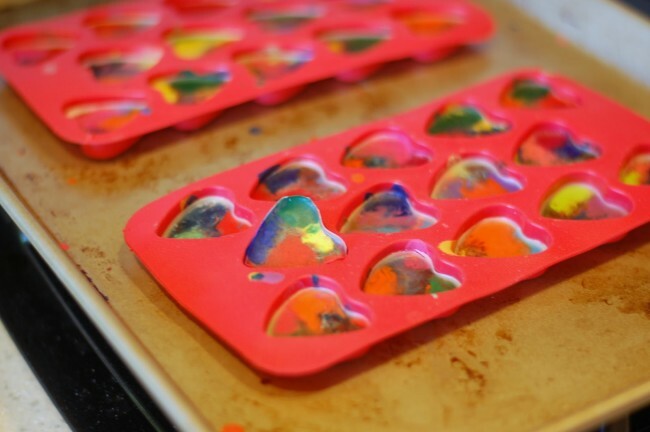 Please note: The silicone mold may be stained and should only be used for crafts once you melt crayons in them. They are not food safe after used for crafts. 9. Now’s the fun part! 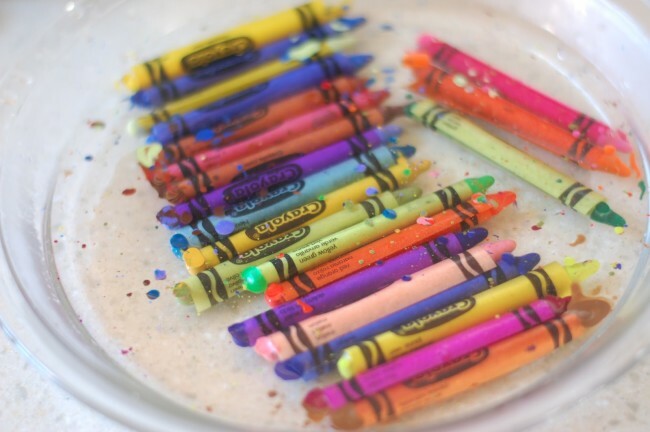 You can decide what you want to do with the crayons once you’ve baked them. I decided to use scrapbooking paper I already had in the house to create a postcard sized Valentine for my son. You can use this printable here for a square valentine with the writing already on the paper or this printable here for a circle valentine (you just have to add your child’s name). Or you can do what I did and use an alphabet stamp set to customize the sayings you put on each valentine. I simply adhered the crayon to a square piece of scrapbook paper with a glue dot and than layered that onto a larger postcard size piece of scrapbook paper. Then I stamped the sayings I wanted as well as my son’s name to personalize it. You can also have your child decorate the postcard paper by drawing or coloring on it before you stamp out your sayings. You can find more sayings here (as well as more printable options!). The possibilities and variations really are endless with this craft. And the kids have a great time helping you make them too. Much more personal then a store-bought valentine and twice as cute! Some moms and dads would rather not attempt to DIY a costume for their kids. Whether it be a hectic schedule, lack of materials or they’re just plain bad at crafts, it’s ok! There is a way to have your kids look super adorable in a DIY costume with none of the super glue or felt flying around the house. A great place I like to look for DIY costumes is Etsy. 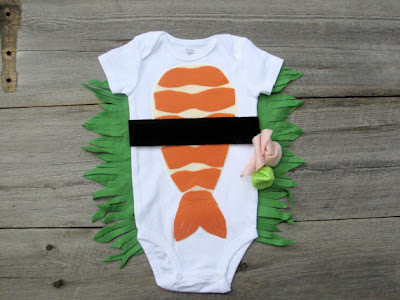 Some of the Etsy stores I’ve stumbled upon have costumes that would be perfect for your little ones. A few weeks ago a good friend, Heather, posted a link to The Wishing Elephant’s Etsy store. The link went to a sushi roll costume and I knew it was the perfect idea for a great DIY costume. Now I don’t have a lot of time on my hands but I was prepared to try and re-create this costume for a news segment we were invited to participate in for The Mama Mary Show and Fox 5 News. I was already making the dino costume for my son so what’s another costume, right? But when I showed Mary the costume she contacted The Wishing Elephant and they surprised us by offering to send over a onesie in my daughter’s size! We were able to get the costume in time for the segment and as soon as we made it to the Fox 5 green room we put it on and were in awe of the cuteness! Everyone who saw Miss M fell in love with the costume and I’m pretty sure that she stole the show. At least she caught the eye of the news anchors! The costume was simple, well made and super comfy for any infant. I added a pair of neutral cream baby legs to protect Miss M’s knees and a cute headband from Evi Luna Boutique to create the look you see above. And not only does The Wishing Elephant have adorable costumes for Halloween, they have a whole array of cute onesies that range from adorable gnomes to the ever so popular Mario and Luigi from The Super Mario Brothers. I’m especially smitten with the bow tie onesie. If we ever had another little boy I’d have to purchase it for pictures (NO! I’m not pregnant!). If you are looking for unique onesies for your little one or the perfect baby shower gift, you’ll find it here! Their appliques are made with eco felt (100% post consumer recycled plastic bottles) so you can feel good about your purchase. Make sure to head on over to The Wishing Elephant’s Facebook page or blog and show them some love from The Simmworks Family Blog! We truly appreciate their generosity. My son is obsessed with dinosaurs. He’s loved them ever since he was introduced to Dinosaur Train on PBS Kids shortly before his second birthday. I thought it’d be fun to try and design a simple dinosaur costume for him to wear whenever he wanted around the house. I didn’t want to spend too much money so I used simple materials I already had and some sponges I picked up on a recent shopping trip. I got the idea from Rookie Mom by doing a simple search for DIY Dino costumes and just adjusted it to fit a two year old. 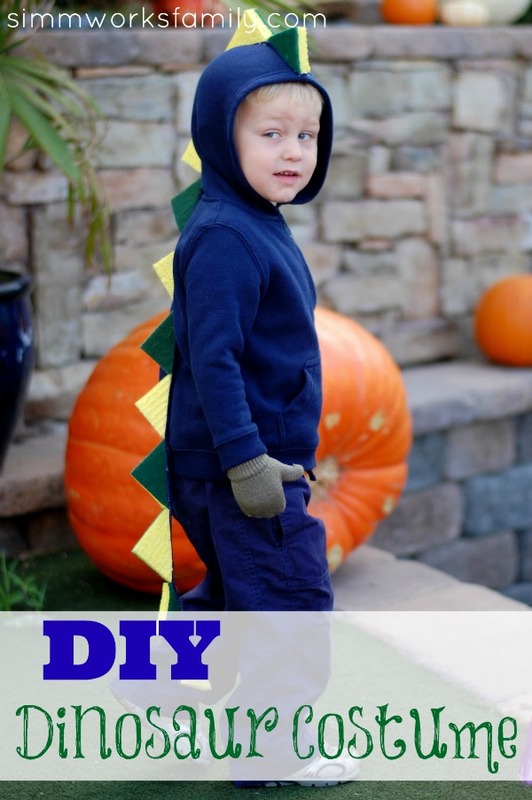 For his 3rd birthday I might attempt to make this Buddy the Dinosaur costume (the no-sew option)… maybe. If you want to make your own DIY Dinosaur costume just follow these simple steps below.